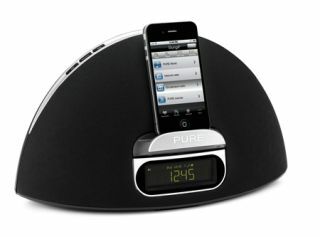 Pure launches £99 Contour 100Di iPad/iPhone dock with DAB radio | What Hi-Fi? Pure is expanding its Contour range of iPod docks with the introduction of the £99 100Di, which sits beneath the original £200 Pure Contour. It's compatible with iPods, iPhones and iPads, includes a DAB radio and has a revolving dock that retracts into the unit when not in use. The free Pure Lounge App for iDevices gives access to a wide range of internet radio stations, podcasts and listen-again programmes, as well as the newly-introduced Pure Music streaming service. Power output is a claimed 20W RMS, there's an FM radio to complement the DAB tuner and a slimline remote that magnetically clips to the back of the dock. Additional features include two alarms, sleep and snooze timers, an aux input and headphone socket. The Pure Contour 100Di is Made for iPhone and iPod certified, and although it is not officially Made for iPad certified, it will still charge and play your Apple tablet.